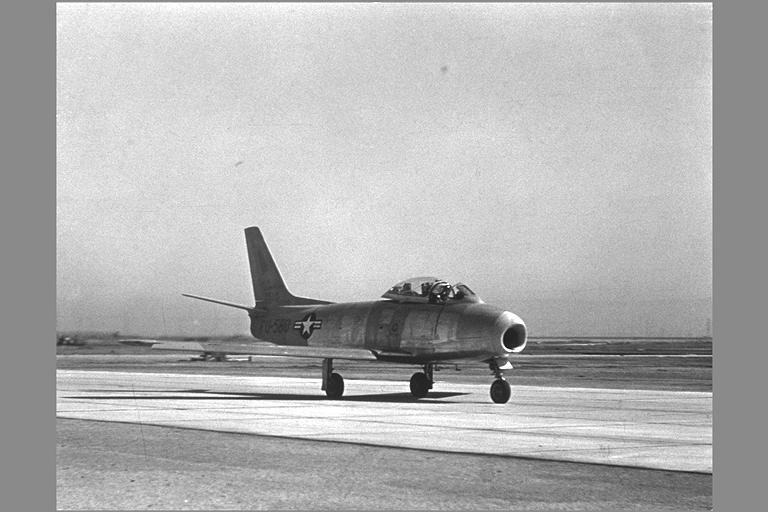 A friend of mine told me that he felt the F-86 model that SectionF8 made looks a little funny around the landing gear, he felt that the struts were too long and that the aircraft sat too high off of the ground. I started comparing the model to many photos that I have of the Sabre, and I think he is right. Is there a reason that the struts look to be about a foot longer than the struts I see in photographs? Perhaps it is a weight issue with the aircraft and if more weight were added the struts would compress. These both look like E models to me. Well, actually you are touching an open nerve here..... AUWW!! Hate it when you do that ! Yes, nobody could be more aware of this particular glitch than me.... It has actually been one of the biggest issues in email exchance between Rob and myself. The damping animation itself is Ok, the wheels and oleo's end up in their specific struts all the way to the end but Rob couldn't get more compression and damping out of the nose wheel and still keep a reasonably amount of 'nose bobbing' upon braking without disturbing other characteristics of the flightmodel. And you're right, weight of the aircraft comes into play here very much so as well. We have tried quite a few variations but at the time this was the best we could achieve. Certainly the nosewheel/oleo ( but the main gear as well to some extent ) should sit much deeper into its strut while the aircraft is on the ground, we hope to manage a much better result during the native FSX conversion of the model. For now i'm afraid this'll have to do. Sorry. Sorry to touch upon an open nerve. I'm glad you are so pained by these little details, it's the reason that Section F8 turned out such a fine product. The reason I brought this up is because I have the feeling (some kind of an instinctual sensor) that the team will soon be putting much more work into the Sabre as the MAAM sim project is completed...... I want to make sure I don't forget to mention anything that I've seen over the last 1,000 hours of flight in this great bird. Perhaps I will send you a private message with a list of the quirks I've noticed in the Sabre (there aren't many). Section F8 knows that they are Sierra Hotel programmers and modelers, so I don't need to tell them again.... but once again, thanks for this fantastic airplane. Good eyes on spotting the V windscreen on the A model. I looked really hard to make sure it didn't have that before claiming it as an E, but I guess my eyes are getting older. The landing gear looks no different to me.